Notoriously brusque but hugely admired and loved, Gary Farr has been making wine in the Moorabool Valley since 1978. While the landscape has undergone many changes in the past decades, Gary’s approach to wine has not and it is this fastidious attention to detail that has inspired a whole generation of vignerons. The reins may have been handed over to his son, Nick, but Gary still keeps a watchful eye over proceedings to ensure the wine continues to meet his high standards. 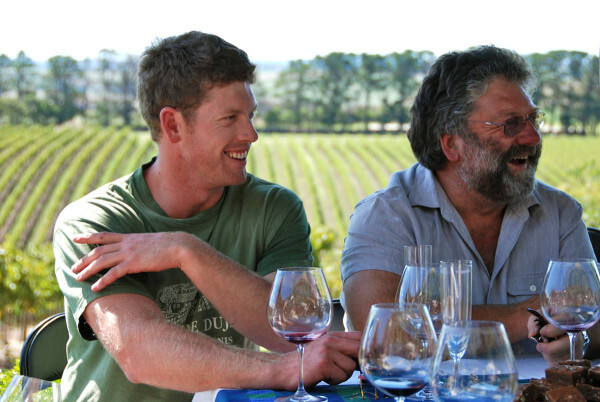 Nick Farr readily acknowledges the influence of his father in his winemaking and viticultural practices—however, these have been significantly enhanced by his own vast experience at vineyards near and far; Rosemount in the Hunter Valley, Innisfail Vineyards in Bannockburn, Au Bon Climate in California, and Domain Dujac in Burgundy. The Farr estate is located in the Moorabool Valley between Geelong and Ballarat, 100km southwest of Melbourne. The rich volcanic soil and continental climate at the estate produces fruit with a flavor, bouquet and color that is unique to the surrounding area.